Not only has this hotel been remodeled recently but also has been stylishly decorated, it is a real feast for the eyes. There is a chic reception area with some seats, a few tables (for breakfast) and a small courtyard. The rooms (we had a superior room with twin beds to the street, a superior room with a queen bed to the street – an upgrade (!) – and a classic room with queen bed to the courtyard) are all tastefully furbished with an optimal use of the admittedly small space and are kept spotlessly clean. The bathroom is wonderfully decorated with fabulous sparkling lights on ceiling and walls but is on the small side, also there is a lack of storage room for your vanity bag. There is an excellent spacious shower with a good water pressure but unfortunately the shower cabin leaks and causes mini floods on the floor. The windows are double glazed and you do not hear the considerable traffic noise from the street, the A/C is efficient and quiet although in one room it did not work properly but that was quickly settled when returning from dinner the first day. The (continental) breakfast (not included in the rate) was excellent. There was a small but attractively presented buffet with a good choice and products of high quality (i.e. freshly squeezed orange juice). There was also complimentary coffee, tea, water and biscuits available during the day in the reception area. At night, there was an nice honor bar with alcoholic beverages. As far as the service is concerned, the employees were always very friendly and helpful. There is free wifi in the whole hotel (worked also well in the rooms) and a workstation in the reception area is at your disposal. The only aspect that is not that favourable is the location of the hotel. 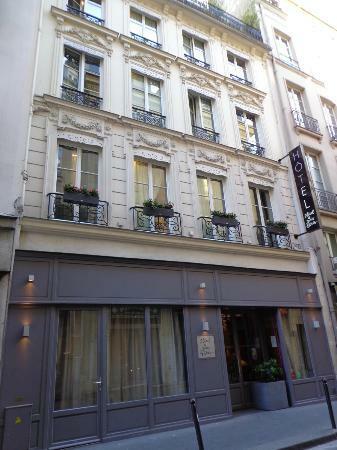 It is situated on a rather busy street (therefore the above mentioned importance of double glazed windows …) in the Latin Quarter, 5 minutes from the Luxembourg Gardens and close to the Marais and the Ile de la Cite. That is not the best but far from being a bad place for visiting all the sights of Paris. The RER (suburban train) can be reached in a few minutes, but the Metro is not that close (about 10 minutes away). All things considered, a very recommended boutique hotel with contemporary chic furnishings, a courteous staff and an acceptable location.